Internship in Brighton > Blog > Internship Tips > Internships X Work Experience: What is the difference? Internships X Work Experience: What is the difference? Internships and work experiences are a great way to gain relevant industry experience and skills. They allow students and graduates to enter the work force and acquire valuable experience in a company. Often, it can be the deciding factor when you are applying for entry-level jobs, as your future employer can rest assured you can keep a job and have started to develop your own work ethics, even if the previous placement was in an unrelated field. Needless to say, whether it’s a short work experience or a longer internship, workplace experience is always viewed favourably by employers and can help you decide your future career. Now, let’s look at the details. 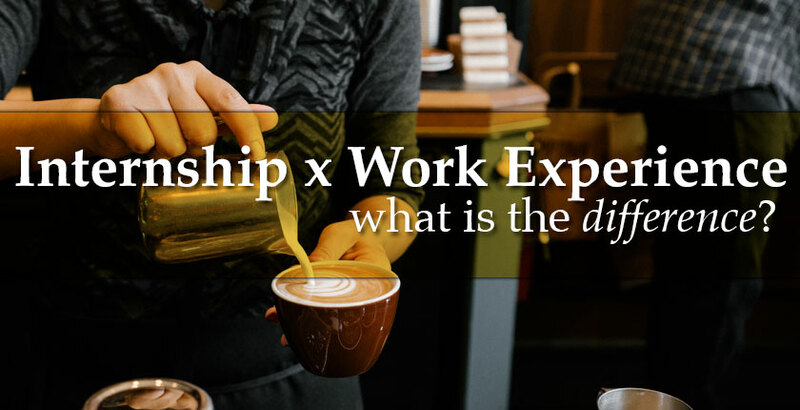 A lot of students, employers and the general public use the terms “work experience” and “internship” interchangeably, and don’t make a big difference about their meaning. In this case, both terms are generally used to mean a period of pre-career experience working at a company or in an industry the person has an interest in working for, held during or just after an undergraduate or post-graduate degree course. However, that is not always the case, and the terms do have a subtle difference in meaning. The term “internship” is most often associated with placements relating to the degree being studied. In other words, usually internships are taken on by students during or right after specialized studies, and relate directly to the subjects being studied. In this type of placement, the idea is to learn more about your field as well as develop your skills. They can help you narrow your focus inside your field. For example, a marketing student could look for a social media marketing internship; or a journalism student could try for an internship in a magazine. Although they can and often do offer some training, you are expected to know the basics and have some skills relating to the industry – so don’t expect to get an internship in IT if you don’t know how to code! Depending on the line of work, an intern might even have the opportunity to be very hands-on and help with specific tasks in a project, specially if your internship is in a smaller companies and if you will be there for a while – but you can also be asked to answer phones or make some coffee. An internship can last from a few weeks to up to an year. A work experience, on the other hand, can be used in a much broader context, and has become a title for any form of participation in a working environment. Usually, it means a placement in a company for a short period of time (the average is anywhere from two weeks to three months, but it can vary a lot!). A work experience is often more about getting work experience in general, and you would get involved in relatively entry level tasks to help support the business in a very practical way. It is great to get some work experience under your belt, as well as an opportunity to start developing your own work ethics. It is great when your focus is on gaining general skills that are not necessarily related to an industry. For example, here at IIB, we especially recommend work experiences to students who prefer or need to focus on improving their English skills while still having an international work experience to add to their CVs. Both work experiences and internships are great features for your resume. In fact, any experience of working within an organisation is incredibly worthwhile and is a great indicator that you have career motivation and strong commercial awareness. So, are you looking for an internship? Or would you be better suited for a work experience? If you still not sure which would be best for you, rest assured that we at IIB would be happy to advise what would be a best fit for your desires, your needs, your skills, and where you are at in your life.